The innovative Motorola LS4278 Bluetooth®-enabled cordless bar code scanner delivers superior data capture anywhere in the workplace. Its multi-line rastering pattern eliminates the need for exact aim, enabling scanning within a 15 metre (50-feet) radius and allowing operator extra room to move. 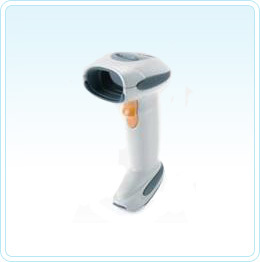 This laser hand-held device excels in retail, healthcare or light industrial environments, boosting productivity and profitability. The LS4278 supersedes the very reliable LS4071/4074 Series. We still have clients using the LS4071 since 2000. Scanner warranty 3 years (36 months) from the date of shipment. The Liquid Polymer Scan Element includes an unprecedented limited lifetime warranty. See full warranty for details. 2 Specifications are subject to change without notice. 1. Do not place the base on top of a CRT monitor since this will cause interference and dramatically reduce the working range. 2. When the scanner is not in use leave it in the cradle to charge. Note: You cannot interchange the batteries between scanners.